A wild rumpus of over the top violence and extremely campy comedy. Macehte is a very cool movie. It was born out of the grindhouse films that director’s robert rodriguez and quentin tarantino made a few years earlier. those movies were meant to be like campy seventies action pictures with all the gore and extreme violence one could desire. and in between the two movies, there were a handful of fake trailers. one of them was for a movie called machete. this is that movie. one thing great about machete, right off the bat, is that it stays true to that fake trailer. every shot from the trailer is in the movie, which means when they wrote the movie, they had to tailor the plot around the trailer, making sure that they could fit every one of those scenes into the storyline. i’m not sure if that’s ever been done before, and that’s pretty cool. especially since the trailer was so impressive. machete starts off with a sort of flashback to a time when our hero was a mexican cop chasing down a drug kingpin. machete (played by danny trejo) drives through the hideout of bad guy torres (steven seagal) and kills everyone around. he uses his machete weapon, which is like a thick sword and just hacks people apart. the opening sequence, as he runs through whoever gets in his way, is a lot of fun. for one thing, it’s shot in that grainy grindhouse way where the screen has all kinds of pot marks on it, and the film seems to jump at times during the action. 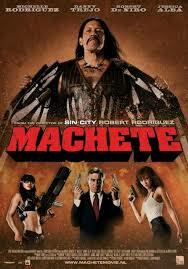 the action is fast and fantastic as machete weilds his weapon around at rapid speeds. and he even runs into a girl without any clothes on who tells him, “it’s too hot for clothes.” all of this is wild and fun. unfortunately, after this opening sequence, the movie will never be quite this frenetic again. we get a very cool credit sequence that is loud and over the top, with drawings of all the different characters, and then we are in present day. now all of a sudden the film is cleaned up. no more pot marks or graininess. no more jumps in the film for no reason. some of the fun is taken away, but not all of it. we still get the extreme violece, the great gushing sounds whenever machete uses his weapon, and the fantastically cheesy one-liners. The plot brings senator aide jeff fahey (the pilot from lost), out to find machete and hire him to shoot the senator (robert deniro). the senator is all about enforicing the immigration laws in mexico so that the immigrants in mexico can’t get over the border. he goes on a shooting spree with his friends in local law enforcement, led by don johnson, and kills the people who are illegally running across the border. then the senator makes speeches about how they should put up an electrified fence that will prevent anyone from getting in. fahey tells machete that this country strives on illegal labor of people who are willing to work for very low wages, and so the senator has to die. machete supports the cause of helping people get across the border and is willing to kill this man who is out to stop it. he gets the money from fahey and gives it all over to a revolutionary leader (michelle rodriguez), who helps sneak illegals into the country while she uses a taco truck as her front. then machete sets up on a rooftop, looks through the scope on his sniper rifle, and prepares to fire. Only, like the trailer shows, the whole thing is a setup. there is another man on a rooftop who takes a shot at macehte and also a shot at the sentator. neither shot is fatal, although the shot on macehte was intended to be. he’s the fall guy and now a whole bunch of men come after him. machete gets into a rooftop shootout, a police car getaway, and a hostpital corridor sequence, all of which are fused by equal parts violence and hilarious dialogue riffs. 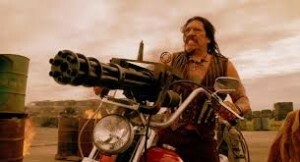 machete is a badass who doesn’t mess around. when the cops say that they forgot to frisk him, he slices through them with his macehte. when a doctor mentions that some scalpels he has can cut through bone, machete grabs a bunch of them, attaches them to a long chain, and swings it around at the bad guys. and when that same doctor tells his girls some interesting facts about how long the human intestines are, machete grabs the intestines out of a bad guy and uses it to swing through a window from one floor to the next. this stuff is ridiculously fun. the movie owes a lot to some of rodriguez’s other films like desperado, grindhouse, and even from dusk till dawn. the guy who narrated the grindhouse trailers is also used for narration work here, with his deep, silly sounding voice playing over commercials for the senator. and like desperado, this movie has an early bare knuckles fight (the guy machete fights even looks like the opponent from the desperado ring, cristos.) it has a scene where machete jumps up on a limo, looks down through the open sun roof and prepares to throw knives through it, and it’s got a scene where gunmen show up to kill him while he’s asleep in bed with his woman. all of this is right out of desperado, where antonio banderas was asleep and threw salma hayek off the bed before opening fire. machete does the same thing to jessica alba. he wakes up, sees the silhouettes of guys outside, and then quietly tosses her off the bed before opening fire. and all of the extreme gore and slicing off body parts combined with rodriguez’s humor really goes back to from dusk till dawn, the first movie where the director began to embrace this style. Machete is a lot of fun. It’s obviously not for everybody with it’s extreme violence and gore. but if you get this kind of humor, and can appreciate it, than this is one of the movies that really does it right. the movie features a wonderful cast filled with great bad guys, from steven segal to jeff fahey to don johnson to robert deniro. and it’s got humor around every corner. machete’s brother, for example, is a preacher, played by cheech marin, and he has security tvs setup in a backroom, stuck together in the shape of a cross. lindsay lohan ends up donning the outfit of a nun and then goes on a shooting spree. there are even nurses in uniform firing off machine guns by the end of the movie. it is a completely wild ride, and a hell of a funny bit of entrainment.